“Sky is as like sky or wall as wall or sky are like each other or skin*” miraculously relates my impressions of Bukola Koiki’s Tyvek Gele sculpture, on view among others in the “FOREIGNERS” show at Nationale. Koiki’s choice of the tyvek material, usually a utilitarian one, to stand in for traditional African cloth, is by its apparent visual symbology given new attributes as a sculpture. That Tyvek is a Dupont invention made to protect half-constructed buildings takes any head- or body-as-house metaphor pretty far; I imagine this arrangement as an augury of people being “housewrapped,” instead of lofts or towers. This renders an immediate, heartening response (to me anyway) — considering the lengths to which people of color might think to go for protection from those who wish to do harm. The apparent absence of a head in Koiki’s headwrap (which is kind of shaped like it covers a head and face) and its blue paint treatment, make the material less sartorially decorative and closer to something like marble. 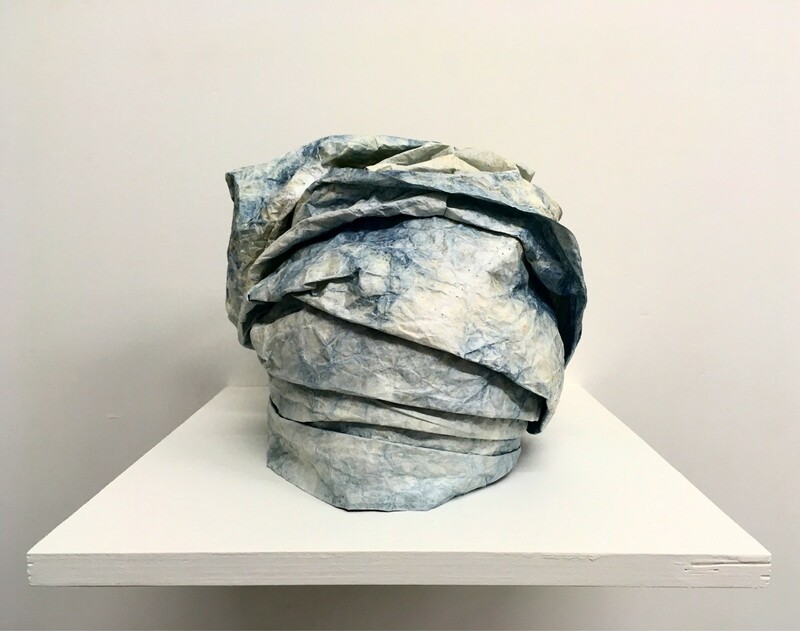 Koiki’s Gele, composed of painted Tyvek and put up on a wooden shelf on a gallery wall, effectively conjures problems of identity and tradition, and their display in a hostile contemporary world. The natural indigo in juxtaposition with the opacity of the material’s chemically-resistant, incombustible finish also makes it look glacial, seeming like a material comment on all kinds of vulnerability. Tyvek can’t tear, resists liquid water but not water vapor, and given the body’s high water content this appears, maybe unconsciously, as a sendup of protection. Instead of Koiki’s overcoming the limits of her medium, which would otherwise be soft, warm, comforting, etc., she has directed it to more powerful and various ends.